Hannibal was born in 247 B.C, in North Africa. He was one of the greatest military generals of the ancient time whom led the Carthaginian army. He was widely known for his strategy of out-thinking and surrounding the enemy with a combined force of infantry and cavalry. Rome and Carthaginian were enemies for a long time. The first conflict between the Roman and Carthage resulted in the first Punic war in Sicily. It lasted for over 20 years, and the Carthaginians surrendered Rome. The conflict was mainly for the trade route control of Mediterranean. Hamilcar Barca was about to carry his troops to Spain, where Hannibal begged him to take with him. He was 9-year-olds at that time. Hannibal grew up with the Hamilcar’s army, where he was directly influenced by it. His hate towards the Rome was the great influence created by his father. Hannibal’s vengeance towards Rome grew with his age. His father fought with Rome for 40 years. He was humiliated by Rome, Hannibal’s hate and vengeance towards Rome created one of the greatest soldiers in history. Here are the top 10 facts about Hannibal you may not know. Hamilcar went to Spain to rebuild the Carthaginian power after Rome took Corsica and Sardinia. Hannibal begged him to join the army. Hamilcar made Hannibal take an oath that “he will always be the enemy of Rome”. Hannibal became commander-in-chief of the Carthaginian army, after the assassination of Hasdrudal in 221 BC. Hannibal was 26 years old at that time. The first major battle of second Punic war started in December of 218 BC. Rome was defeated by Hannibal’s army, with over 10,000 casualties. Hannibal passed the mountains Alps with over 50,000 infantry, 9,000 cavalry, and 37 elephants to attack Rome in their land. He almost lost half of his army during the trip. Hannibal could not attack by ship because Roman had control over the seas. Instead, he invaded by land, passing through the most dangerous Alps route with his massive army. The key component of the Hannibal army was 37 African elephants. After crossing the Alps, Hannibal reached to the plan, which was inhabited by Gauls. Gauls hated Romans. They welcomed Hannibal. Hannibal left his winter quarter Bologna and went to Appennines and Eturia. During a minor engagement, he lost vision in one eye. Some historians claim he suffered from Ophthalmia. At the end of the Alps, there was stone blocking their way. Hannibal used wine and firewood to clear the way by melting the snow at the bottom of the stone, which broke the stone into parts and cleared their way. The battle of Cannae was one of the most famous battles ever fought by Hannibal with his greatest military tactics. Rome almost lost around 50,000 to 70,000 men in the battle. However, Hannibal only lost around 4,000 men. Carthage’s economy was deteriorated in 196 BC. Hannibal was chosen as Suffete by the people of Carthage. His greatest achievement in the second Punic war was remarkable and remembered throughout history. Hannibal was the greatest general with an undefeatable military strategy. His brave attempt to fight against Rome with brilliant strategy, which no one had ever imagined at that time, made him of the finest military General Commander of the ancient history. Hannibal was a great general because he employed successful tactics used by previous generals. The double envelopment he employed at Cannae was used at the battle of Marathon a century before. Most of his success came from facing arrogant Roman statesmen rather than seasoned generals. Once Hannibal faced a skilled roman general his army was soundly defeated at Zama. I don’t wish to belittle his genius but to understand and draw meaning out of history requires a less 2 dimensional approach. Delve into Polibius and Livy and you’ll find a fuller and much more rewarding view of the incredible events of which we are the sum. Please don’t quit. Scipio learned from Hannibal. Scipio could never achieve what he did if it wasn’t for Hannibal. Remember his own men turned on him and he was tired, never lost a battle for 11 years on Italian soil. Had scipio fought him head on in the peak of his stay in Italy ,scipio would have been anialated. And one on one Hannibal was a freak swordsman and warrior. Always took charge in battle , never stood back, that’s why he earned the name lightning. Um. . .Hannibal never taught Scipio how to make elephants useless. That Scipio could “never” have defeated hannibal etc. is a bit silly, I think, how could anyone know such a thing. Also, Hannibal’s forces were not really undefeated in Italy it’s just that they were never destroyed. Scipio the elder won an early cavalry engagement in 218 and a slave army made up of Cannae survivors had success too–let’s not forget Fabius’ strategic victories. Hannibal was able to keep his forces together for 14 years or so by avoiding battles that didn’t favor him outright (I must admit Cannae was insane!). He went 14 years fighting like 4 major battles–no wait, those battles were all fought between 218 and 215 he went 11 of those years without any major victories. Hannibal’s men never turned on him. Scipio was the vastly superior general to Hannibal: his plans were richer in strategy and nuanced tactical brilliance. Hannibal was essentially useless without a cavalry advantage as Zama clearly illustrated. Having the same initials I very nearly thought I sleep-typed your response. Marathon, Zama, Livy and polybious are the exact points i would have made. Hannibal and Scipio were great battlefield commanders BECAUSE they knew their history and modified that knowledge to suit the present. Personal history about Hannibal is almost entirely prose from Livy-Hannibal being a freak swordsman is not information gleaned from any primary source (There really aren’t any) so that one is just hooey. At Zama, according to actual sources, Hannibal had his forces replenished save for the legendary Numidian cavalry (Scipio forced them to fight for the Romans). He also was given 80 elephants that Scipio the younger handled easily with a bit of planning. Hannibal was soundly defeated because Scipio chose the battlefield; an honor Hannibal had heretofore enjoyed. Hannibal knew how to slap armored Roman politicians around but he had 0 success against shrewd battle commanders like Quintus Fabius and Cornelius Scipio the younger (Africanus the elder). In Italy, 100,000 Roman farmers against 35,000 trained mercenaries is a feat to revere, but let’s not go crazy. And as for one on one? 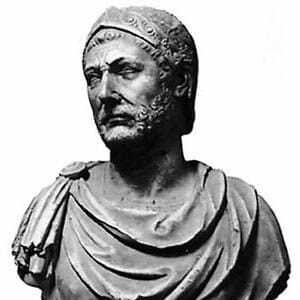 According to Livy, Hannibal had his chance, he used it to beg Scipio to leave the field–of course, Livy was born 150 years later and did not cite any lost sources. If he was born in Africa why does he have white features. He was an African not European. He was born in North Africa, Carthage, Tunisia, which is along the Mediterranean coast. Climate-wise it isn’t much different than Rome, Athens, Barcelona, etc. Furthermore, his father was born in Spain and the Barca family were Phoenicians (modern-day Lebanese people). Do a simple Google search of “Phoenician art” and you’ll see how they depicted themselves as appearing. Being born in Africa doesn’t make you Black or make you look “African.” By your logic, the actress Charlize Theron should look “African” since she was born in South Africa. The Carthaginians were Phoenician colonists in a coastal city in North Africa that is closer in distance to Rome than it is to 97% of the African continent. Maybe because it’s North Africa, not sub-Saharan Africa. Maybe he was a Berber? The Romans called their wars with the Carthaginians “the Punic wars”. The word “Punic” is a derivative of “Peoni or pheonii” (phoenician) because Carthage was founded by semitic tribes from the near east. This was true with much of the ancient north coast of Africa. One other small point; prejudice in classical antiquity was not based on skin color but culture, more specifically, language.